The Jolley trail is located in New Castle, Colorado. 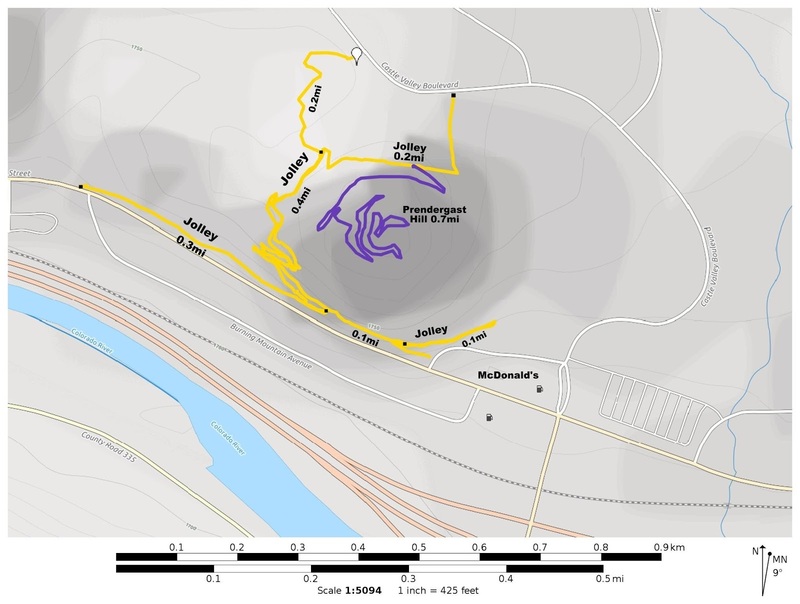 The trail crosses a saddle between Highway 6, which travels through the Town of New Castle as Main Street, and Castle Valley on the north side of Prendergast Hill. Named in recognition of the Jolley brother's that settled in the area in 1919, with many of their descendants still living on the same original lands, the Jolley trail was built upon land that was originally owned by Herb Jolley. For this post we began at the Jolley trailhead on Castle Valley Blvd. The trail starts out by taking an easy route around the sagebrush flats between the trailhead and Prendergast Hill. After crossing the sagebrush flats the trail splits with one fork leading toward the Prendergast Hill trail and the other in the direction of downtown. The downtown route makes a pleasant trip through a juniper forest across the saddle between the two sides of the mountain. On the south side of the hill the trail gets a little narrow as it hugs the steep sloping terrain. A series of switchbacks take the trail closer to the level of the highway where the trail splits once again. The right branch travels just above the highway toward the downtown area before coming to an end. Going in the other direction the trail leads toward McDonald's and City Market. 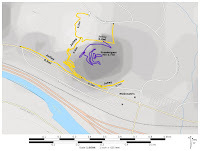 There is also a short spur that travels part way around the east side of the base of Prendergast Hill before coming to an end. Back at the first fork in the trail the other branch can be followed for a short distance to the point where the Prendergast Hill trail begins. The trail continues on past the Prendergast Hill junction where it turns back toward Castle Valley Blvd. When we were there for this post there was some new construction that was beginning that looked like it was going to cause the trail to undergo a bit of a reroute. 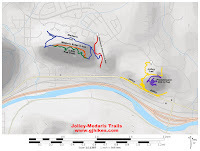 We had driven past the Jolley trailhead on multiple occasions while enroute to other trails in the area including the Centennial and Colorow trails. 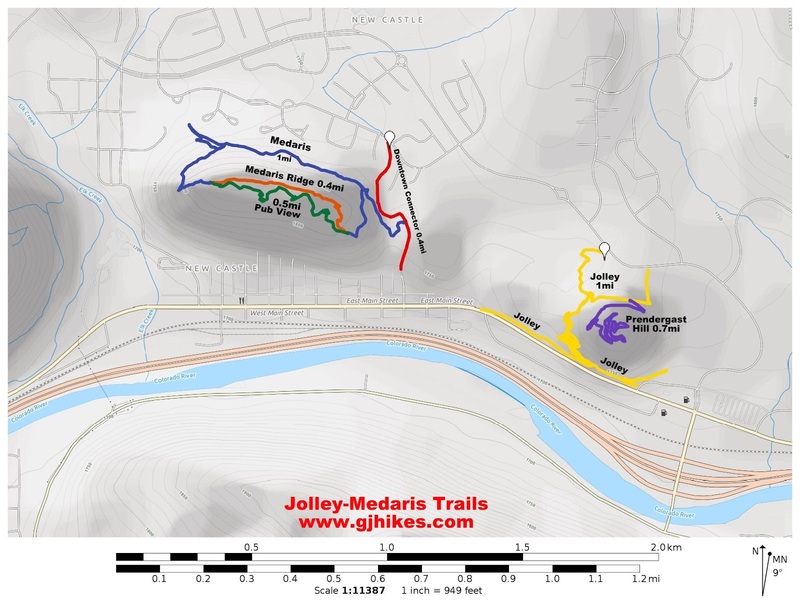 Upon further investigation we discovered that between the Jolley and nearby Medaris trails that New Castle had some nice hiking and mountain biking opportunities right in their midst. If you would like to see it for yourself then all you have to do is grab your bike or 'Take a hike'.